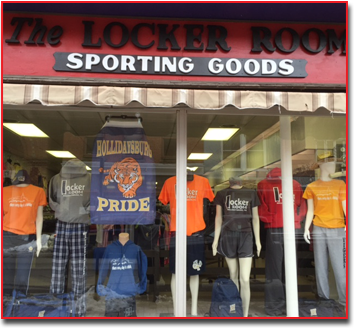 The Locker Room is your local hometown sporting goods and apparel store serving the area since 1973. We are located in historic downtown Hollidaysburg Pennsylvania, but serve all of the Blair county and surrounding central Pennsylvania areas. We specialize in custom team uniforms, screen printing and embroidery. With our in-house graphic artist, we can customize your team or corporate logo and have your design applied to your choice of thousands of different types of apparel. Check out our brands/vendors tab to shop for ideas for your team or organization. line of officiating apparel and equipment for football, baseball and basketball officials. 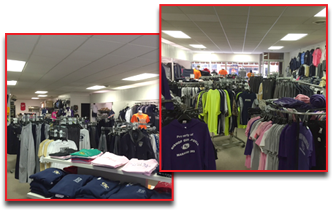 Our retail store has a wide variety of school spirit wear for the local school districts. We are fully stocked with Hollidaysburg Golden Tiger and Bishop Guilfoyle Marauder apparel and also carry the Hollidaysburg Jr. and Sr. High gym uniforms. Stop in and see us for all of your custom screen printing and embroidery needs. If you haven’t been in the store lately, you won’t recognize it. Stop in and let us get you geared up for your next event!! Whether you are looking for team uniforms or post-season apparel to commemorate your championship team - every game and every season starts and ends in The Locker Room!! Equipment and Clothing for all sports - Whether you are playing or watching the game - we have everything you need. From Custom team uniforms to fan wear for Moms and Dads, we have it all. With quality vendors like Badger, Holloway, Augusta, Teamwork, Charles River and many more (visit our brands/vendors tab) we have a product at the right price for everyone. Our equipment prices won’t be beat locally – often too low to even advertise. We are a dealer for Wilson Sporting Goods, Easton, DeMarini, Evoshield, BWP Bats, Lizard Skin bat wraps, Champro, and many many more. Get your custom team uniform today! Quality baseball bats for all ages. Stay warm with your team hoodie. Would you like to receive our newsletter and promotional offers? Sign up today!